January 29, 2013, Saitama, Japan - Tamron Co., Ltd., a leading manufacturer of optical equipment, announces the development of a high-power zoom lens designed for Micro Four Thirds mirrorless cameras. The metal lens barrel exterior is available in two colours: black and silver, providing the most popular colour options to match high-end cameras. *3 The circular diaphragm retains a near circular shape even when taken two stops down from a wide-open position. *1 Length is the distance between the mount face and the tip of the lens. *2 Entire length is the distance between the tip of the lens and the tip of the protrusion. This product conforms to the "Micro Four Thirds System Standard" established by Olympus Imaging Corporation and Panasonic Corporation. Micro Four ThirdsTM and the Micro Four Thirds logo marks are trademarks or registered trademarks of Olympus Imaging Corporation, in Japan, the United States, the European Union and other countries. The company names and product names in this document are the trademarks or registered trademarks of their respective owners. The stepping motor's actuator allows finely tuned control of angular rotation, and since it drives the focusing mechanism directly without an intermediate reduction gear, it also provides superbly quiet performance. 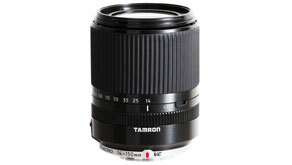 Tamron's VC mechanism employs a three-coil system, whereby three driving coils activate the shake-compensating VC lens group electromagnetically via three ceramic balls. The VC lens elements are held in place only by contact with the ceramic balls, achieving smooth movement with little friction. This provides a stable viewfinder image with excellent tracking performance. As the VC lenses can be moved in parallel only by electrical control, the mechanical structure is simple, enabling downsizing of the lens body.